The Rexist Party (French: Parti Rexiste), or simply Rex, was a far-right Catholic, nationalist, authoritarian and corporatist political party active in Belgium from 1935 until 1945. The party was founded by a journalist, Léon Degrelle, and, unlike other fascist parties in the Belgium of the time, advocated Belgian unitarism and royalism. Initially the party ran in both Flanders and Wallonia but never achieved much success outside Wallonia and Brussels. Its name was derived from the Roman Catholic journal and publishing company Christus Rex (Latin for Christ the King). The high point of Rex saw it win 21 of 202 deputies (with 11.4% of the vote) and twelve senators in the 1936 election. Never a mass movement, it was on the decline by 1938. During the German occupation of Belgium in World War II, Rex was the largest collaborationist group in French-speaking Belgium, paralleled by the Vlaams Nationaal Verbond (VNV) in Flanders. By the end of the war Rex was widely discredited, and was banned following the liberation. Initially modelled on Italian Fascism and Spanish Falangism, it later drew closer to German Nazism. The Party espoused a "right-wing revolution" and the dominance of the Catholic Church in Belgium, but its ideology came to be vigorously opposed by the leader of the Belgian Church Cardinal van Roey, who called Rexism a "danger to the church and to the country". The ideology of Rex, which was loosely based on the writings of Jean Denis, called for the "moral renewal" of Belgian society through dominance of the Catholic Church, by forming a corporatist society and abolishing liberal democracy. Denis became an enthusiastic member of Rex and later wrote for the party newspaper, Le Pays Réel. The original programme of Rexism borrowed strongly from Charles Maurras' integralism. It rejected liberalism which it deemed decadent and was strongly opposed to both Marxism and capitalism, instead striving for a corporatist economic model, idealising rural life and traditional family values. In its early period — until around 1937 — Rexism cannot accurately be categorised as a fascist movement. Rather it was a populist, authoritarian and conservative Catholic nationalist movement that initially tried to win power by democratic means, and did not want to totally abolish democratic institutions. The party increasingly made use of fascist-style rhetoric, but it was only after Degrelle's own defeat in a by-election in April 1937 that it openly embraced anti-Semitism and anti-parliamentarism, following the model of German Nazism. The historian and fascism expert Roger Griffin only considers the Rexist Party during the German occupation of Belgium as "fully fascist", until then he considers it "proto-fascist". The Rexist movement attracted support almost exclusively from Wallonia. On 6 October 1936 Degrelle made a secret agreement with Rex's Flemish counterpart, the Vlaams Nationaal Verbond (VNV; "Flemish National Union") led by Staf De Clercq. Both movements strove for a corporatist system, but unlike the Rexists, the VNV sought to separate Flanders from Belgium and to unite it with the Netherlands. The Flemish side cancelled the agreement after just one year. It also faced competition from the ideologically similar (but explicitly anti-German) Légion Nationale ("National Legion") of Paul Hoornaert. Léon Degrelle, founder and leader of Rex. The Rexist Party was founded in 1935 after its leader Léon Degrelle had left the mainstream Catholic Party which he deemed too moderate. It targeted disappointed constituencies such as traditionalist Catholics, veterans, small traders and jobless people. In the Depression era, it initially won considerable popularity—mostly due to its leader's charismatic appearance. Its greatest success was when it won 11.5% of the votes in the 1936 election. Therefore, the Rexist Party could take 21 of the 202 seats in the Chamber of Deputies and 8 out of 101 in the Senate, making it the fourth-strongest force in Parliament, behind the major established parties (Labour, Catholic, Liberal). However, the support for the party was extremely localized: Rexists succeeded in garnering over 30 per cent of the vote in the French-speaking province of Luxembourg, compared with just 9 per cent in equally French-speaking Hainaut. Degrelle admired Adolf Hitler's rise to power and progressively imitated the tone and style of fascist campaigning, while the movement's ties to the Roman Catholic Church were increasingly repudiated by the Belgian clergy. Rexism received subsidies from both Hitler and Mussolini. Degrelle ran in the April 1937 Brussels by-election against Prime Minister Paul van Zeeland of the Catholic Party, who was—to avoid victory of the Rexists—supported by all other parties, including even the Communists. The Archbishop of Mechelen and primate of the Catholic Church of Belgium, Jozef-Ernest Cardinal van Roey intervened, rebuking Rexist voters and calling Rexism "a danger to the country and to the Church". Degrelle was decisively defeated: he lost by 20 to 80 percent. Afterwards, Rexism allied itself with the interests of Nazi Germany even more strongly and incorporated Nazi-style antisemitism into its platform. At the same time, its popularity declined sharply. In the 1939 election, Rex's share of votes fell to 4.4% and the party lost 17 of its 21 seats, largely to the mainstream Catholic and Liberal parties. With the German invasion of Belgium in 1940, Rexism welcomed German occupation, even though it had initially supported the pre-war Belgian policy of neutrality. While some former Rexists went into the underground resistance or (like José Streel) withdrew from politics after they had come to see the Nazis' anticlerical and extreme anti-Semitic policies enforced in occupied Belgium, most Rexists, however, proudly supported the occupiers and assisted German forces with the repression of the territory wherever they could. Nevertheless, the popularity of Rex continued to drop. In 1941, at a reunion in Liège, Degrelle was booed by about a hundred demonstrators. In August 1944, Rexist militia were responsible for the Courcelles Massacre. Closely affiliated with Rex was the Légion Wallonie, a paramilitary organization which later became the "Wallonien" Division of the Waffen SS. After Operation Barbarossa started, the Légion Wallonie and its Flemish counterpart, the Legion Flandern sent respectively 25,000 and 15,000 volunteers to fight against the Soviet Union. 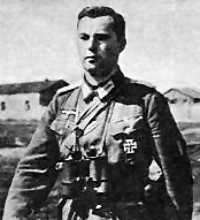 Degrelle took command of the Wallonien division, where he fought on the Eastern Front. Whilst Degrelle was absent, nominal leadership of the party passed to Victor Matthys. From the liberation of Belgium in September 1944, the party had been banned. With the fall of Nazi Germany in 1945, many former Rexists were imprisoned or executed for their role during collaboration. Victor Matthys and José Streel were both executed by firing squad, Jean Denis (who had played only a minor role during the war) was imprisoned. Degrelle took refuge in Francoist Spain. He was convicted of treason in absentia in Belgium and sentenced to death, but repeated requests to extradite him were turned down by the Spanish government. Stripped of his citizenship and excommunicated (later lifted in Germany), Degrelle died in Málaga in 1994. ↑ Cook, Bernard A. (2005). Belgium: A History (3rd ed.). Peter Lang. p. 118. 1 2 3 Griffin, Roger (1991). The Nature of Fascism. Pinter. p. 132. ↑ Griffiths, Richard (2005). Fascism (2nd ed.). Continuum. p. 117. ↑ Feldman, Matthew; Turda, Marius (2008). "Introduction". Clerical Fascism in Interwar Europe. Routledge. p. xvi. ↑ Gerard, Emmanuel; Van Nieuwenhuyse, Karel, eds. (2010). Scripta Politica: Politieke Geschiedenis van België in Documenten (1918-2008) (2e herwerkte dr. ed.). Leuven: Acco. p. 112. ISBN 9789033480393. 1 2 Brustein (1988). "The Case of Rexism". ↑ Étienne, Jean-Michel (1968). Le mouvement Rexiste jusqu'en 1940. Armand Colin. ↑ Griffin, Roger (1991). The Nature of Fascism. Pinter. pp. 132–133. ↑ Geheim akkoord tussen Rex en VNV quoted in Gerard, Emmanuel; Van Nieuwenhuyse, Karel, eds. (2010). Scripta Politica: Politieke Geschiedenis van België in Documenten (1918-2008) (2nd revised ed.). Leuven: Acco. pp. 119–20. ISBN 9789033480393. ↑ Capoccia, Giovanni (2005). Defending Democracy: Reactions to Extremism in Interwar Europe. Johns Hopkins University Press. p. 114. ↑ De Wever, Bruno (2006). "Belgium". World Fascism: A Historical Encyclopedia. 1. ABC-CLIO. p. 86. ↑ Paxton, Robert O. (2004). The Anatomy of Fascism. Alfred A. Knopf. p. 74. ↑ Richard Bonney Confronting the Nazi War on Christianity: the Kulturkampf Newsletters, 1936-1939; International Academic Publishers; Bern; 2009 ISBN 978-3-03911-904-2; pp. 174-175. 1 2 di Muro, Giovanni F. (2005). Léon Degrelle et l'aventure rexiste. Bruxelles: Pire. pp. 151–3. ISBN 2874155195. 1 2 3 di Muro, Giovanni F. (2005). Léon Degrelle et l'aventure rexiste. Bruxelles: Pire. pp. 160–1. ISBN 2874155195. ↑ Domenico, Roy P. (ed. ); Hanley, Mark Y. (2007). Encyclopedia of modern Christian politics: L-Z (1. publ. ed.). Westport, Conn.: Greenwood Press. p. 163. ISBN 0313338906. Brustein, William (February 1988). "The Political Geography of Belgian Fascism: The Case of Rexism". American Sociological Review. 53 (1): 69–80. doi:10.2307/2095733. de Bruyne, Eddy; Rikmenspoel, Marc (2004). For Rex and For Belgium: Leon Degrelle and Walloon Political & Military Collaboration 1940-45. Helion. ISBN 1-874622-32-9. De Wever, Bruno (2007). "Catholicism and Fascism in Belgium". Totalitarian Movements and Political Religions. 8 (2): 343–352. doi:10.1080/14690760701321312. Streel, José. La révolution du XXème siècle (réédition du livre paru en 1942 à la NSE à Bruxelles), préface de Lionel Baland, Déterna, Paris, 2010.